Initial training in the TH-55 and instrument training in the UH-1 preceded specialization. “When you got to tactics, you were either a Scout guy or a Utility Guy,” explains Col. Bryant. “I’d been doing a lot of scout-like missions at Fort Irwin. My father was Cavalry for most of his 40-year military career. I absolutely loved being in the Scout track.” Flight school standings earned the new OH-58 pilot a Cobra transition and an assignment to Korea flying AH-1Fs. When back from Korea, Tom Bryant attended advanced military intelligence and electronic warfare courses and accumulated fixed-wing time in RU-21s and RC-12s over Honduras, some with the Military Intelligence Battalion for Low Intensity Conflict. The experience led to an assignment as assistant product manager for the MH-60K at the Army Special Operation Command’s (USASOC’s) Technology Applications Program Office (TAPO) at Fort Eustis. Colonel Bryant observes that SOF testing and acquisition has its own special character. “There is to this day a tremendous sense of ‘I’ve got to get this right or somebody may get hurt, or worse, and my work may embarrass the nation.’” SOF programs also involve clear and constant interaction with a few very knowledgeable users. “These folks hold the acquisition process and you brutally accountable.” A subsequent Pentagon tour as the Department of the Army Staff Coordinator, time in Huntsville as Product Manager for Aircrew Integrated Systems, and an assignment as Project Director for Rapid Fielding taught more acquisition lessons. 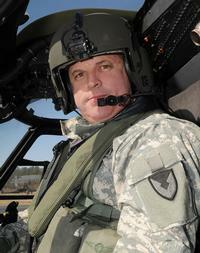 Back at Fort Eustis in charge of the SOF TAPO in 2006, Colonel Bryant became the Project Manager charged with taking the new MH-47G Chinook through operational testing, fielding and production modifications quickly. The TAPO was simultaneously testing the MH-60M Black Hawk for SOF equipment integration. “It was really paramount to get more SOF aviation assets out there because we had deployed SOF since late September 2001. We needed to get the new capabilities out there.” The MH-47G went to war in 2007, and the MH-60M is due to achieve Initial Operational Capability in 2011. Colonel Bryant took command of AATD on June 30, 2009 and notes, “This unit was formed in World War II to do what we’re doing today.” The directorate has 244 people, including engineers, test pilots, maintainers, craftsmen and support personnel with 19 years of average time in their respective career fields. “We’ve got people who know what they’re doing, who like being here, and are doing the job,” says Colonel Bryant. Operations Enduring Freedom and Iraqi Freedom continue to tax Army aircraft in high-hot operations and Degraded Visual Environments. AATD propulsion and drive systems developments now aim at density altitudes of 6,000 ft at 95°F. “The engine programs that we have, the drive programs – gears and drivetrain components – those are full-steam ahead. We’re doing down to the material science on how we can get engines to burn hotter, the fracture-fatigue characteristics of transmissions and drivetrains.” The high power-density transmission technology in the Block III Apache Longbow emerged from AATD research. AATD systems engineers have meanwhile demonstrated DVE countermeasures, including the Brownout Situational Upgrade symbology and Helicopter Autonomous Landing System radar. No matter how effective and desirable such systems may be, engineers need to minimize their impact on the host aircraft. “We need open architecture where it’s easier to get things on the airplane,” says Colonel Bryant. “And we need to get things smaller. Yes, you can probably get a 120 lb cable warning device today. We probably need it to be 10 lb or less. engineers’ knowledge and our pilots’ qualifications. We also modernize our design, analysis and instrumentation capabilities.” The technology organization is meanwhile refreshing its ranks with new-hire engineers. “Actually, average age of our workers has gone down over the last five to six years. We have a tremendous young influx across our science and technology areas that is just dynamite.